Chevron Corporation operates as an integrated energy company worldwide. Chevron Corporation is a component of the S&P 500 and Dow Jones Industrials Indexes. The company is also a dividend achiever, which has been consistently increasing its dividends for 21 consecutive years. 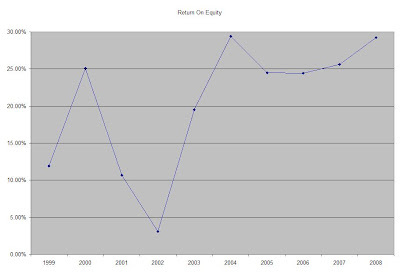 From the end of 1998 up until December 2008 this dividend growth stock has delivered an annual average total return of 9.40% to its shareholders. At the same time company has managed to deliver an impressive 25% average annual increase in its EPS since 1999. The increase in prices of crude oil and natural gas definitely helped with earnings. The rapid fall of energy prices in late 2008 and early 2009 and weak global demand could lead to lower earnings per share in 2009 to $4.70/share according to some analysts. After that expectations are for a recovery in earnings to at least $7/share. Any analysis of earnings trends for an oil and gas producer such as Chevron would definitely depend of the future prices of energy commodities over the next few years. Nevertheless the dividend is sustainable at current levels and there definitely is some room for dividend growth in 2009 and 2010. The ROE has consistently remained above 20% since 2003 after earlier volatility in this indicator in the early 2000s. Annual dividends have increased by an average of 8.30% annually since 1999, which is lower than the growth in EPS. On the other hand however Chevron has been rewarding stockholders with share buybacks as well. An 8 % growth in dividends translates into the dividend payment doubling almost every nine years. Since 1988 Chevron Corporation has actually managed to double its dividend payment almost every ten years on average. The dividend payout has largely remained above 50% after 2003. Before that it did shoot up above 50% in 1999, 2000 and 2002. A lower payout is always a plus, since it leaves room for consistent dividend growth minimizing the impact of short-term fluctuations in earnings. Chevron Corporation is trading at a P/E of 5.60, yields 4.00% and has an adequately covered dividend payment. The forward P/E for 2009 earnings is close to 14. In comparison Exxon Mobil (XOM) trades at a P/E multiple of 8 and yields 2.40%, while British Petroleum (BP) trades at a P/E multiple 5 while yielding 8.40%. I find Chevron attractively valued at current levels given its stable dividend growth history. If you are looking to add exposure to the energy sector for your dividend portfolio then CVX could just be the right stock for you.